‘Everyone has two eyes but no one has the same view.’ Wael Harakeh. | Sally says . . . eat, sleep, work, read, play, draw, bark . . .
← ‘I look upon every day to be lost, in which I do not make a new acquaintance.’ Samuel Johnson. ‘Everyone has two eyes but no one has the same view.’ Wael Harakeh. Last week’s homework from my ‘Seeing’ art class was to highlight the differences in how we see, what we see—and also what we don’t see—when we look at something really quickly as opposed to looking deeply and intently at the same object. It was a ‘quick, quick slow’ exercise. The idea was to pick a ‘fairly complex’ object and to do a quick one-minute rough sketch of it in whatever medium we chose (I chose watercolour, just because it seemed easiest. HA! Shows you how much I know.) Once the initial sketch was completed we were then to slow right down and to spend the next half an hour, longer if preferred, to really look at the object and to add in the detail on top of the original sketch—correcting it as we went. Sounds easy enough doesn’t it? Mmmmm. Well, first of all I don’t really do ‘one minute sketches’, in pencil, watercolour or any other medium. Nothing I have ever drawn in one minute has ever looked even vaguely akin to what I was attempting to copy. And this was no different. 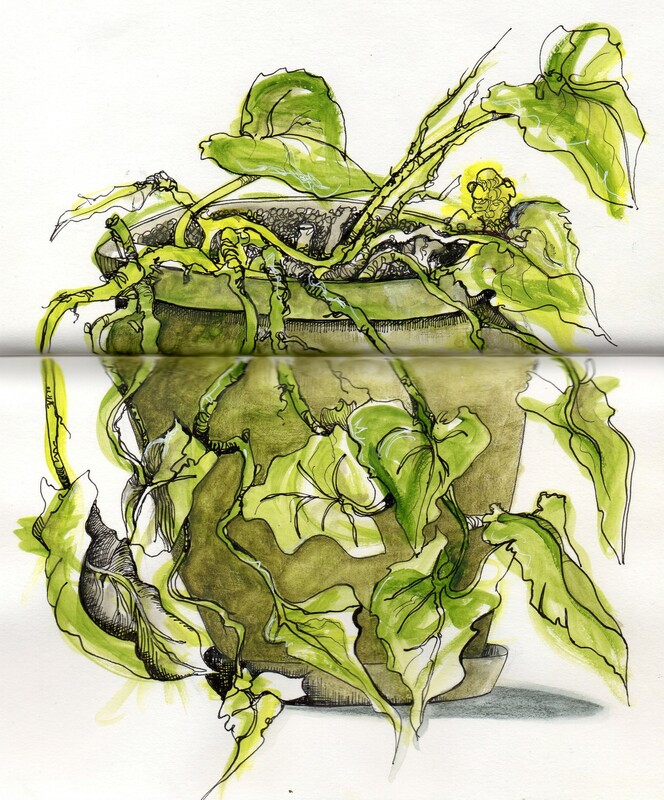 In hindsight I didn’t really think through attempting to sketch a green plant in a green pot and I guess I shouldn’t have been all that surprised that I ended up with a fuddled green blur and not much else. I loved this concept but it certainly didn’t look easy! You are so clever! I love your sketch it is very detailed for a quick one. I want to see you do one of your sketches on a canvas so I can hang one in my new house. Now that is an idea we will have to negotiate this Sal. I would love one done of my puppies. For an exercise, that’s really amazing! Well done!